Note 1: Like wrestling games? Check out my reviews of WWF WrestleFest and 3 Count Bout! Saturday Night Slam Masters, while often overlooked, is easy to find. Quick History: Released for the Super Nintendo Entertainment System in 1994, Saturday Night Slam Masters is a home console port of an arcade game with the same name that was released in 1993. 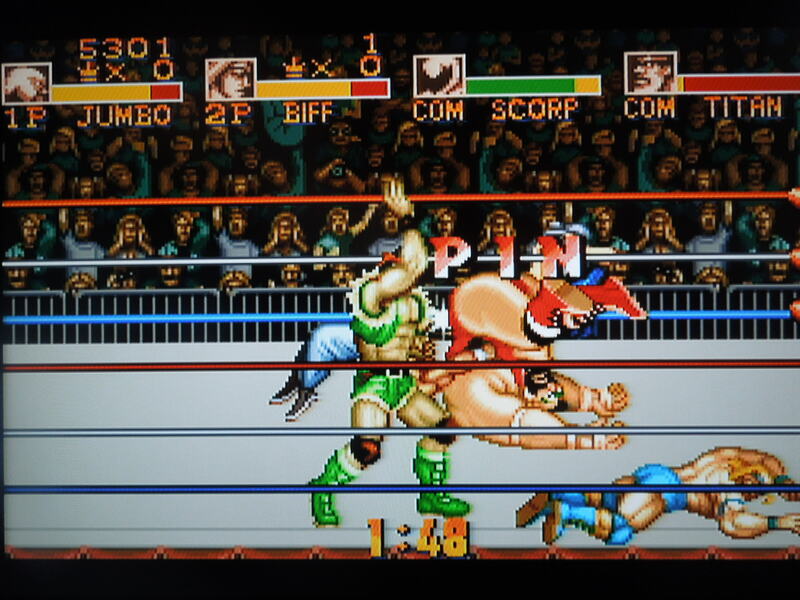 Unlike other SNES wrestling games, like WWF Royal Rumble or WWF Raw, Saturday Night Slam Masters uses fictional wrestlers, although some of them do resemble popular wresters from the 1980s and 1990s. 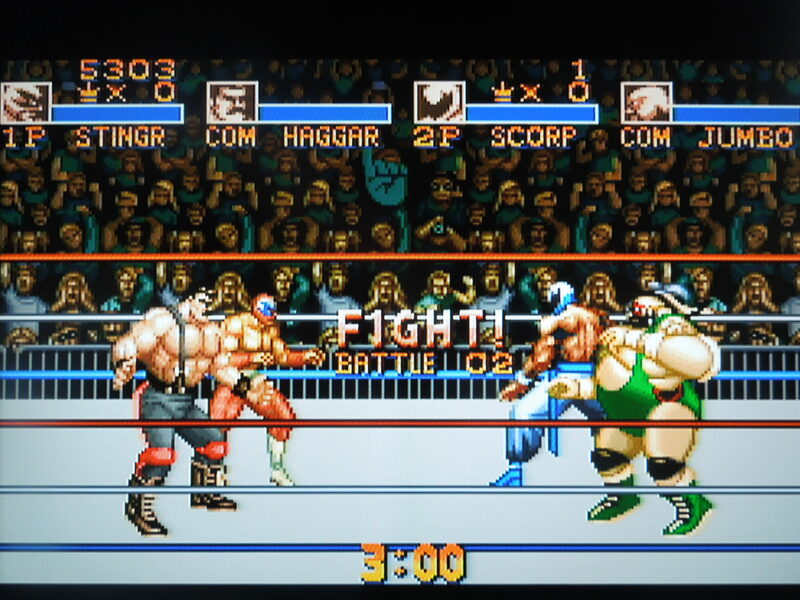 Saturday Night Slam Masters, unlike other SNES wrestling titles, functions more as a hybrid of a wrestling + fighting game (like Street Fighter II). 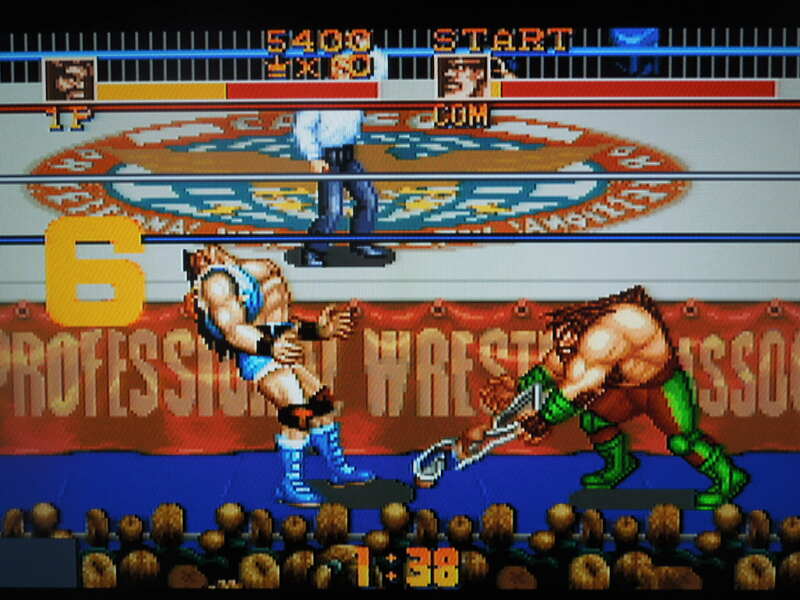 Because of its lack of real-life wrestlers, Slam Masters was overlooked by many SNES owners. 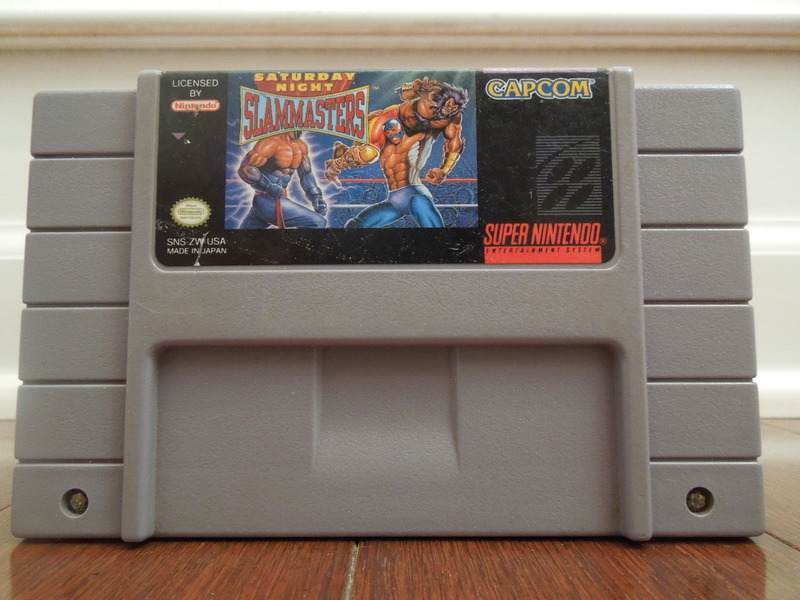 Although the game is not terribly ‘obscure,’ it has perhaps been more simply ‘ignored’ by many SNES owners, which is a shame, because it’s a fun wrestling game (in my opinion, obviously). Gameplay: Slam Masters has two modes of play: Single Match and Team Battle Royal. In Single Match, you select 1 of 8 wrestlers and battle your way through 1-on-1 matches for a chance to fight the champion for the CWA Championship. In Team Battle Royal, you and a partner (either human or CPU) battle other 2-man teams for the chance to be tag-team champions. Note: Although I use the term ‘tag-team,’ there is no ‘tagging’ in Slam Masters. Both you and your partner are in the ring at the same time, fighting both members of the opposition – once either you and your partner have been pinned or submitted, or both members of the opposition have been pinned or submitted, the match ends. 10 fictional wrestlers (8 in Single Match Mode) are available in Slam Masters. Control: Being based on a 3-button arcade game, Slam Masters employs the same scheme. Y attacks (punches or kicks), B jumps, and A pins your opponent. Pressing Toward + Y grapples with your opponent. In a grapple, Up or Down + Y executes a wrestling move, like a suplex, and Left or Right + Y whips (sends your opponent running into and bouncing off of the ropes). Pressing Toward, Toward makes your wrestler run, then pressing Y makes him execute a running move, like a clothesline (you can also press B followed by Y for a jumping/running move). Pressing Toward, Toward near a turn buckle causes him to climb it, then pressing B followed by Y executes a flying move, like a flying elbow. While on the turnbuckle, repeatedly pressing A causes your wrestler to turn red with energy, and this makes you more likely to win grapples. In Single Matches, you can climb out of the wrestling ring by pressing Toward, Toward, or Down, Down. While outside the ring, you have until the ref counts to 20 to bash your opponent with a chair, bottle, or metal box (use Y to pick up and swing items). Use chairs and tables when fighting outside the ring. 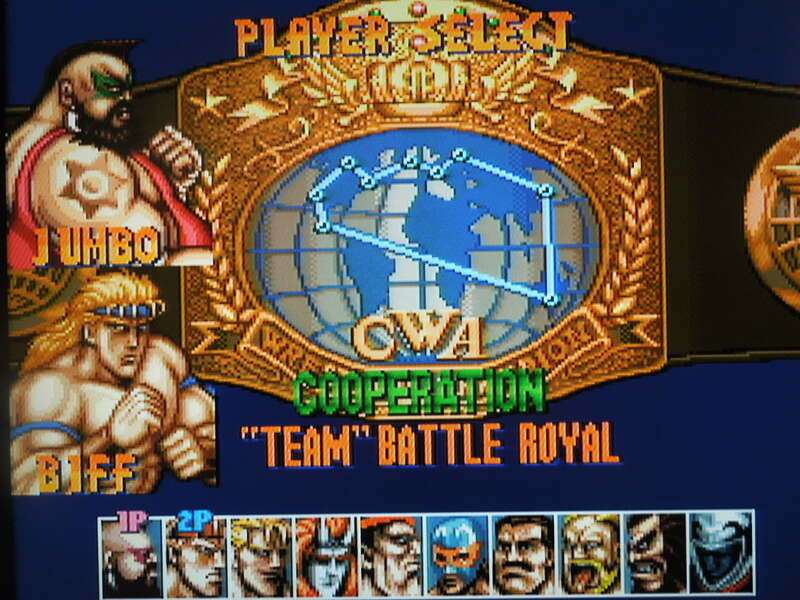 Wrestlers: Mike Haggar (from Final Fight), Scorpion, Jumbo, Biff Slamkovich, El Stingray, Titanic Tim (looks like T. Hawk from Super Street Fighter II), the Great Oni, Alexander the Grater, Gunlock and King Rasta make up the game’s wrestlers. The wrestlers each hail from different countries, and each one has his own unique moves. Some wresters (like El Stingray) are extremely quick, but not strong, while some (like Titanic Tim or Haggar) are slow, but have powerful moves. Note: Scorpion and Jumbo are only selectable in Team Battle Royal. Music and Sound: Average. You wrestle in different international places (that all look alike), like London, New York, Hanover, or Moscow. Each wrestler has his own musical theme, but none are too memorable. The wrestling moves sound okay – when you power bomb your opponent, the sound effect is pleasing. Basic strikes, like kicks and punches, are passable, but barely. Overall, you won’t be displeased with the action sounds, just not impressed, either. Win by either pin or submission. Unlimited Continues: Slam Masters, being based on an arcade game, functions like one – albeit one with unlimited Credits. No matter how many matches you lose, you can always continue. Difficulty: In the Options menu, you can set the difficulty from 1 (easiest) to 8 (hardest). Beating the game on 1 star is none too difficult, but bumping up the difficulty will cause an adequate challenge after the first few matches. So, where can I find this game? EBay, Amazon. This one is easy to track down. You can also play the rom an a computer emulator. 2 player wrestling co-op? It’s well-executed here. Conclusion: Saturday Night Slam Masters is a fun, if extremely simple, wrestling game. I love the simplicity, though. The action is fast and furious, and the co-op Battle Royale mode is fantastic. 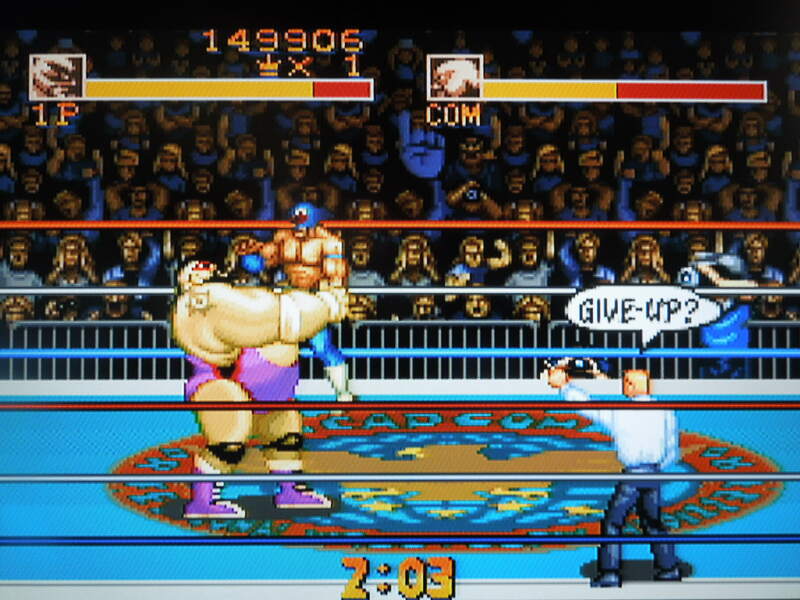 It’s as good as any wrestling game on the SNES.